One of the most important things to know when choosing a Legal Nurse Consulting course is that each course is different. There are no universal standards for Legal Nurse Consulting, there is no official board, and there is no one main governing body. Each organization that offers Legal Nurse Certification sets their own standards, has their own curriculum, has their own board, and is responsible for ensuring that their Legal Nurses meet those standards. With that said, it becomes obvious taking the time to compare courses is very important. This is a big decision that should not be made hastily. Since there is such a difference in the training that you receive, choosing the wrong course can make it much more difficult for you to achieve a long-term and reliable Legal Nurse career. The scary truth behind many Legal Nurse training programs is that many of those Legal Nurses never even get their first case. Just because a course is offered from the biggest organization or has been around the longest, does not mean it’s the best. It is up to you to compare and see the difference. In the end, your goal should be to find the course that will give you what you need to recover your expense and make Legal Nurse Consulting a great source of income for you. Most courses cannot do that. Here are some important comparison points that can help you see what you would really be getting out of a course. This aspect is obviously very important since it varies with each course. The easiest way to determine the comprehensiveness of a curriculum is to compare the contact hours. For example, the LNC STAT course offers at least 120 contact hours, while others only include 40-60. So, LNC STAT offers more value for your money, and you are learning much more so you will be better prepared when you start practicing. In addition to quality training, it helps tremendously to have support throughout the transition process, and thereafter. The course you choose should be able to help you whenever you have a question or problem. Some courses offer no mentoring after you complete the course, or charge extra. 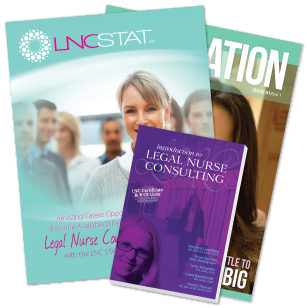 LNC STAT offers unlimited mentoring during your training process, and even afterwards when you are trying to get cases or are working cases. To ensure that you can make Legal Nurse Consulting a reliable and long-term source of income, you need to know how to find the cases and secure those cases effectively. This is where effective marketing techniques and tools become important. The course you choose should offer researched and target marketing techniques. Some courses include marketing tools while some require you to pay more, while others don’t offer them at all. You shouldn’t have to make them yourself since most Nurses don’t have marketing experience. In addition to the marketing tools, the course should also show you current and effective marketing techniques. For example, trifold brochures no longer work in this industry. So, if a course is offering or teaching you to use them, you know their marketing methods are outdated. Reviews are very helpful to see what others are saying about a course. When comparing, search for reviews and success stories from course graduates. If there are a lot of complaints, or if there is a lack of reviews, that is a big red flag. This holds true for courses offered by universities as well. It only makes sense that a good training organization will keep track of how well its graduates do when they begin putting what they learned to work. When comparing Legal Nurse courses, look for the success rate or some similar statistics. The success rate is the percentage of course graduates who are able to get their first case and make money as a Legal Nurse. If they don’t have this information, that is a warning sign that their success rate is low, or they don’t keep in touch with their Legal Nurses enough after they complete the training. Despite what most people may think, the most cost effective way to become a Legal Nurse Consultant is not with a cheaper course. The truth is, the cheapest course usually ends up being the most expensive path to a Legal Nurse Consulting career, because you will typically need additional training to really understand what to do. You shouldn’t have to take several different courses to learn everything you need. Surprisingly, many Legal Nurse courses fall short in these essential areas. With your time and money at stake, a hasty decision when choosing a course can seriously hinder you from getting started as a Legal Nurse. Do your research and look for these indicators to get the most out of your Legal Nurse career.